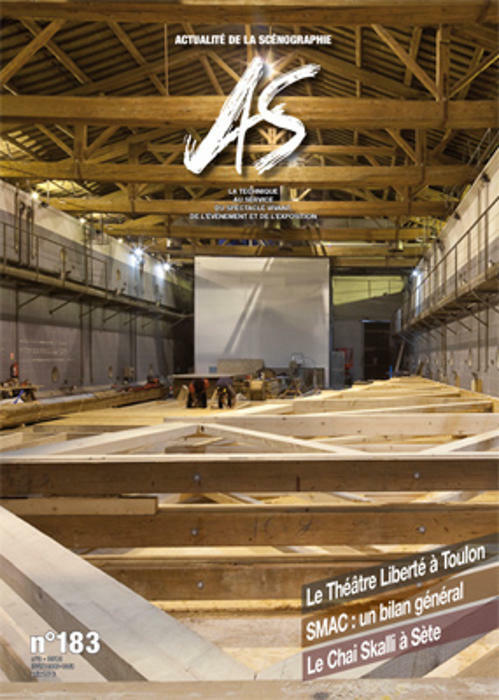 Creation of a temporary theatre and music venue, on an old wine cellar, the Chai Skalli, during the renovation works of the Molière theatre in the city of Sète located at a distance of a few hundred meters. From an acoustic point of view, the original room had a reverberation time of five seconds because of its proportions and the installation of huge cisterns on its sides, which acted as ‘resonators’. The first contains a front desk and a bar, the second one the stage and the audience, and the third one the backstage and the theatre boxes. A number of reflectors were installed above the stage and the audience, in order to increase the sound reflection density between the stage and the audience area. As for the reduction of the reverberation time, the underside of the roof was partially covered with a high absorbing material. To avoid any possibility of sound coupling, the openings were also covered, giving onto the wooden cisterns.